The Datamax E-3202 has been discontinued. No direct replacement is available. 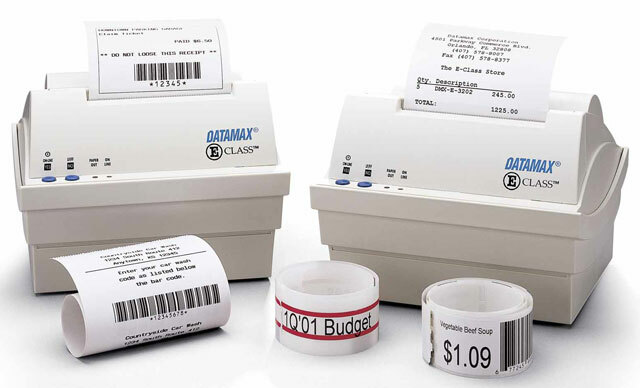 A small, compact, lightweight, direct thermal printer designed for a variety of on-demand home or office labeling applications. The E-3202 printer is a small, compact, lightweight, direct thermal printer designed for a variety of on-demand home or office labeling applications. Typical labels created on the E-3202 are shipping, file folders, videotapes, diskettes, data cartridges and much more! With PDF417 and MaxiCode 2D barcode capability, the E-3202 can also print complex transportation symbols. Additionally, in ESC/POS mode, the E-3202 is also capable of interfacing with existing point of sale (POS) application software, and may be an excellent choice for VARs and System Integrators to propose as an alternative to more expensive POS printers. All units ship with product documentation. Direct thermal, 203 dpi, 2 ips, 3.14" print width, serial interface, black mark sensor, 256KB SRAM, 512KB flash. Includes US power cord. Order cable separately. See accessories.